Ben L. Pfeifer, M.D., Ph.D.
Medical Studies and Specialty Training at Humboldt-University Berlin, Germany; Senior Consultant Physician at Department of Anaesthesiology / Intensive Care at Humboldt-University Medical Centre; Senior Consultant Physician at Philipps University Marburg, Germany; Medical Director at Cancer and Pain Treatment Centre, Bad Mergentheim, Germany. Visiting Professor and Fellow at University of South Florida, USA; Medical Director of Immune Therapy Clinics of Playas de Tijuana, Mexico; Visiting Professor at University of California, San Diego, California, USA; Second Specialty Training at University of Kentucky, Lexington, Kentucky, USA; Assistant Professor, Director for Clinical Research and Attending Physician in Department of Anaesthesiology at University Medical Centre of University of Kentucky, Lexington, Kentucky, USA. 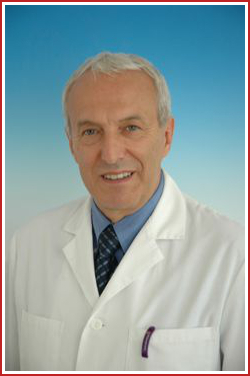 Senior Consulting Physician at the Department of Oncology of Aeskulap Hospital, Brunnen, Switzerland; Director for Clinical Research at Aeskulap Hospital, Switzerland; Director of Research and Development at Aeskulap-International, Lucerne, Switzerland.